As you're about to see, we've had the most exciting day today! We had jumping on the trampoline. The offering of toes for pictures. Cartoon network (just realized it's been a long time). And spooning milk from the rice crispies bowl into a little cup. 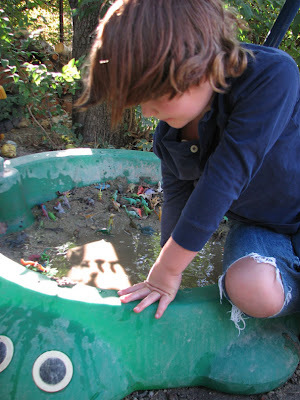 Playing with dinosaurs and building oceans in the sandbox. And now we've been to Hollywood Video, and we are gonna watch Scooby-Doo (the realistic one, as Trev calls it) and we also borrowed (the realistic, also, not cartoon) Dinotopia. We are livin' la vida loca! What a fun day you all had! My boys want a trampoline but I just don't know where we'd put one. THey are so much fun. Oh, yes, it was SO fun. Don't you wish YOUR days were filled with such exciting things such as baths and a bowl of cereal! Give me a hot bath and A Knight In Shining Armor anyday!